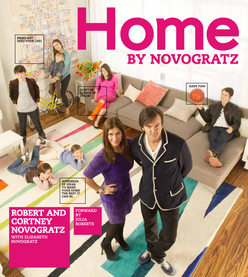 In this book, design duo Robert and Cortney Novogratz (stars of HGTV’s Home by Novogratz) give us an inside look at twenty of their favorite projects to show us how to achieve their signature “vintage modern” style. See how they effortlessly mix contemporary furniture with thrift-store finds, and learn all sorts of tricks for creating a stylish home no matter what the obstacles: seven children, small spaces, or a tiny budget. From a toddler-friendly bedroom for triplets to a beach retreat for two twenty-somethings, from a New Jersey basement to a Palm Beach cabana, Home by Novogratz proves that good design is just a book away.